Don't let the economical price fool you! Superior quality oozes from every part of the Swedish-made Logun Solo. This shrouded rifle is filled with high-pressure air from a hand pump, scuba tank or electric compressor (200 bar or 2,900 psi). 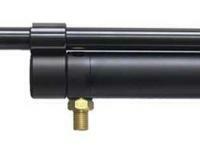 The unique valve system reduces lock time by allowing the released air to send the pellet on its way quicker. The beautiful hardwood Monte Carlo stock has a raised cheekpiece. There's checkering on the grip and forearm to make sure you've got a firm grasp. The ventilated rubber buttpad helps keep the rifle firmly in your shoulder. The gun is virtually recoil-free, which may be hard to believe when you see pellets go screaming downrange! Speed means nothing without accuracy, which is why the Logun Solo comes with a Lothar Walther barrel, considered by most airgunners to be one of the most accurate airgun barrels made. Remember to order a scope and mount when you buy this rifle, because it doesn't come with sights (it has 11mm dovetails). Click on the AMMO link for a list of recommended pellets. Check the ACCESSORIES link for hand pumps, compressors, scopes, mounts, targets and maintenance items. Things I liked: Light weight and easy to hold. Super accurate out to 60 yards which is the limit to my range. I used it to hunt this past weekend and every squirrel I had a shot at dropped like a rock. Things I would have changed: I would prefer a right or left hand stock rather than ambidextrous. What others should know: I have had this Logun Solo with the shrouded barrel for 9 months; you can't go wrong with this rifle; It is pure quality. Things I would have changed: The finish on the stock could be improved, mine arrived with a small chip out of the finish. 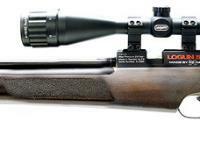 What others should know: I bench tested this gun against a Steyr with a Deben 10-50 scope. the ctc of the 5 shot groups were identical at 22 yards. Fast and accurate! 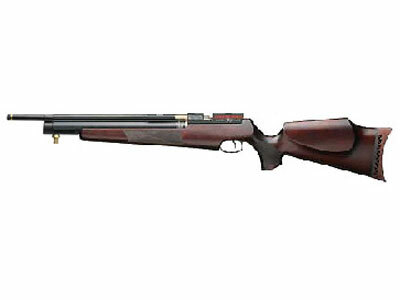 Great for hunting, target shooting, plinking and more. One of the best bargains in precharged rifles!